What could big data do for microbrewing? Craft beer lovers are about to find out. PicoBrew is a Seattle startup that this summer will fulfill the more than 2,000 pre-orders placed through Kickstarter for its $699 Pico product. 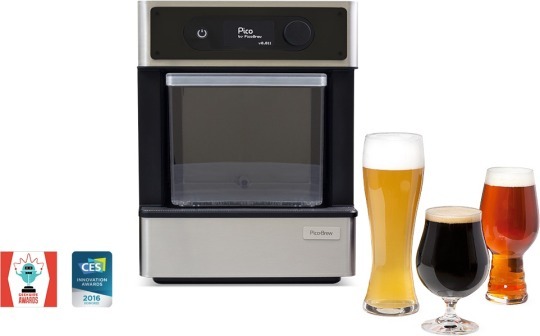 The compact countertop system makes brewing beer at home as simple as making a K-cup of coffee, with the added advantage of wi-fi connectivity. Wondering how is wi-fi an advantage in brewing? It’s to collect and share big brewing data, of course. The system and its commercial-grade predecessor, the $2,000 Zymatic, are the brainchildren of Microsoft engineer-inventor Avi Geiger, a connected-devices guy, and the beer-loving Mitchell brothers—Bill, a former Microsoft VP, and Jim, a food scientist and physicist—who wanted more scientific control over their home-brewing processes. PicoBrew VP of Sales and Marketing, Donald Brewer—yes, that’s really his name—says both products are Internet of Things devices. Connectivity enables users to access a huge assortment of craft beer recipes including thousands of variants of IPAs, double IPAs, stouts, and porters. It also gives brewers nearly infinite flexibility for tweaking those recipes and tracking every experimental detail. And it enables PicoBrew to capture loads of information relevant to the $22 billion craft beer market. PicoBrew can capitalize on the trends it notices, such as the hops users are most interested in, how they’re altering recipes, new requests coming from different regions of the country and world, and the seasonal beers that are popular even out of season. To use the Pico, one needs no homebrewing experience. Simply place an online order at PicoBrew’s BrewMarketplace for a compostable “PicoPack” containing the requisite hops and other ingredients to make a small keg of your favorite craft microbrew in 2 hours (fermenting takes another 5-7 days). Commercial brewers from Abita to Zonderik are “channel partners” who have approved the recipes shared under their brand names. A PicoPack goes for $15 - $29 and produces a volume just greater than the typical 12-pack of beer. That’s comparable to grocery store prices, Brewer says. So why take the time to brew your own mini-keg instead of picking up a 12-pack? “People have forgotten that beer is like bread,” Brewer says. “Fresh tastes a lot better than old and stale. In this new craft beer movement, you have so many unique beers that are not intended to sit on a shelf.” The Pico, he says, gives users a fresh beer with commercial-quality precision that may taste better than the same beer that was bottled and kept in a grocery warehouse for weeks before purchase. The Pico also lets beer fans taste brews they might not otherwise get the chance to. With more than 4,000 breweries in the U.S. today, and 1 or 2 opening every day, Brewer says distribution is mostly hyper-local. That means that someone in San Diego is going to have a hard time getting their hands on a can of Heady Topper without going to Vermont, while people in Maine pine for Pliny the Elder from California. While The Alchemist and Russian River, makers of those two elusive beers, aren’t among the BrewMarketplace partners yet, more than 100 top-rated breweries—including Dogfish Head, Rogue, and 21st Amendment—are, and Brewer says he’s working on the others. What’s in it for participating breweries? Royalties with no effort, he says. “Dogfish Head earns money without distributing one bottle of beer. We produce the Pico packs to their quality standards and they get instant royalties without any effort.” Plus, he says, they get worldwide exposure. PicoBrew’s Kickstarter campaign generated $1.4 million in pre-orders from around the world. Brewer says some prominent breweries offer recipes for beers they’ve never distributed, or create new recipes exclusively for PicoBrew. Amateur brewers will also be able to share their own recipes via the BrewMarketplace for the chance to earn some acclaim and even royalties. PicoBrew’s first machine, the Zymatic, which has been in use for two years already by craft breweries and some supergeeky homebrewers, requires a bit more know-how. But Brewer says it’s transforming the way brewmasters perfect their recipes. Typically, he says, when a brewery wants to experiment with new hops or recipes, it would have to dedicate a brewmaster and a half-barrel system to a brew day. With the Zymatic, the brewery can simply load in hops and grain, use a Web-based tool to design a recipe, and have a perfectly controlled process. “Many breweries out there are pretty excited that they can knock out multiple recipes in a day and iterate a recipe again and again and again, because it’s not consuming a full day of brewing,” Brewer says. Another thing going for the Zymatic is the increasingly competitive brewing market, he says: “When you have 4,000 breweries competing, the guys with the best product are going to win. We think this $2,000 machine is inexpensive from a lab equipment perspective.” It is if great craft beers start getting even better.